Then I stirred the pasta with the sauce. Sabrina couldn't try it because she's allergic to nuts. Ok, here I am eating it. My mom really liked it. It was okay, not my favorite. I like pasta with butter and olive oil. And pepper. And cheese. But I'm glad I tried it. Here's the recipe if you want to try it. Cook the fusilli and bow ties separately in a large pot of boiling salted water for 10 to 12 minutes until each pasta is al dente. Drain and toss into a bowl with the olive oil. Cool to room temperature. 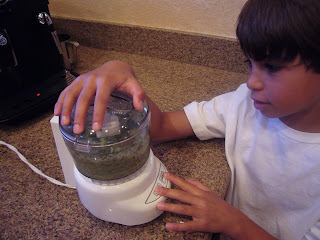 In the bowl of a food processor fitted with a steel blade, puree the pesto, spinach, and lemon juice. Add the mayonnaise and puree. 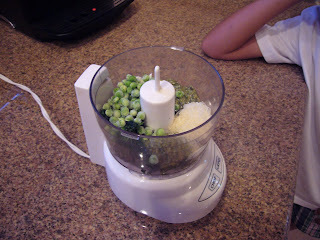 Add the pesto mixture to the cooled pasta and then add the Parmesan, peas, pignolis, salt, and pepper. Mix well, season to taste, and serve at room temperature. What a wonderful blog and a worthy goal. The pasta looks great. We loved ours! Great job! 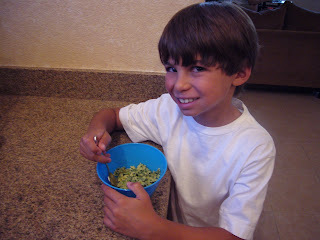 I have never tried pesto before, either! Great idea and lovely blog. I'm impressed you tried a kind of grown up food! I love your blog! Great job, you too! I'm sorry to hear Sabrina couldn't taste it because of the nuts, but maybe you can both try the parmesan chicken in a couple weeks. Keep up the good work. 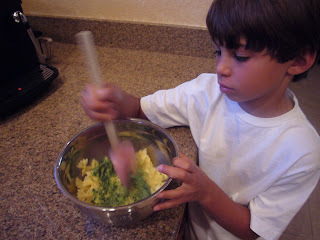 Great that you tried it and the food processor is fun to use isn't it!?! Sabrina - I made mine without nuts because my husband is allergic too them also. I used Ina's pesto recipe but left out the nuts - you should try it that way if you want to give it a shot. looking forward to your mom's recipe next week! !